Fall back and Fall in Line! 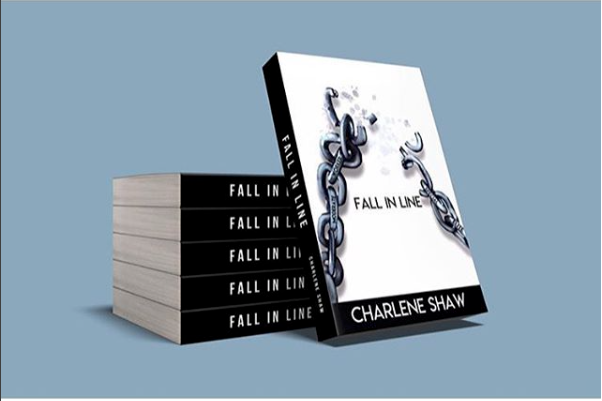 Literature with Charlene Shaw..
As the saying goes ‘we’ve all got a book in us’. All of our lives include a myriad of emotions, experiences, and moments of hope, our mere existence encapsulates a story worth telling. We met with secondary school English teacher, and now self-published author, Charlene Shaw to talk about her first book, Fall in Line, some of her favourite titles, and what lessons being a teacher has taught her..
Fall in Line is a novel is centred on the female character of Jaiyana, a shy mixed raced secondary school student whose life gets turned upside down by changes to her GCSE exams. Despite her nervous character, she realises the power of speaking truth to power and finds herself head to head in contention the first black newly appointed Head of Education and orchestrator of the NSEM, Fabian Clarke. Fabian is a bitter businessman and former scientist, who in his rise to power, is determined to continue to seize control with his new academic scheme, despite having been a victim of institutional racism. The inspiration for the book came from real life events in Charlene’s teaching experience, “the idea came into my head about 5 years ago when I training to be a teacher, and the Government suggested changes to exam system. I was so shocked but no-one knew what was happening, and was unsure of how to guide students through the process and I thought, this would make a good story. Charlene followed the news coverage of the changes over the last 5 years while mirroring the story in her chapters. She tells us that the book was completed in 2016 and after sharing some chapters with a connection in publishing, she was offered a publishing offer, “I did have an initial publishing offer but they re-tracked it because we had a slight conflict of interests. I’m still deciding whether to go down the traditional publishing route or to listen to some people who’ve said ‘Charlene, it’s 2017, publish your own book!’”. As an author, it was only right to ask what some of Charlene’s favourite titles include, she shares that one of her all-time favourites reads comes from the Black British shores, ‘Noughts and Crosses’ by Malorie Blackman. I was very confused about my identity when I read it. I am from a very white area, and I really stood out from everyone else at my school. It was the first book that I really connected with because of the black protagonists and the mixed race child. A more recent favourite is the 4.7 star Amazon rated novel ‘The Hate you Give’ by Andrew Thomas, “it is absolutely incredible. It’s about a black protagonist who witnesses her best friend get shot by a white policeman. It’s amazing, I read it in 2 days – I couldn’t put it down! As a mixed raced woman, Charlene claims that Jaiyana’s character unintentionally takes on some of her traits. Through her trials and in her triumphs, it’s only when her former students read some of the chapters and said “Madame, this is you” – yes the students call teachers Madame at Charlene’s school. The popular statement, ‘if you’re the smartest in the room, you need to find a new room’, is unfortunately that’s not the case with teaching, in Charlene’s opinion. As a young woman, it would be easy to think that secondary school students would automatically relate, but she passionately shares that this is not the case. “I think a lot of young teachers, go into the profession thinking that students will be able to relate to them. That’s the biggest misconception. You have to spend the time to develop your relationships with the students and I think that’s something a lot of teachers overlook. Instead, they walk into a classroom and assume they should be respected because they are the teacher. I realised that early on and saw that it was a case of ‘I will give you my respect until you prove me otherwise’”. Charlene’s new book can be purchased from here on Amazon. Charlene will also be joining Jamelia Donaldson, Azyrah Harvey and Victoria Ankrah for a new podcast on The Colour Network called ‘Fully Booked’. The podcast features for book worms with very different literary styles discussing literature, lifestyle and culture, with the help of the occasional special guest. Join Charlene at her book launch on Tuesday 13th February at Patch Bar, London, EC4V 5EA. Tickets can be purchased here. If you’re reading a job spec and being filled with dread, why are you clicking apply?